Notebook love and candy! – It Works For Bobbi! 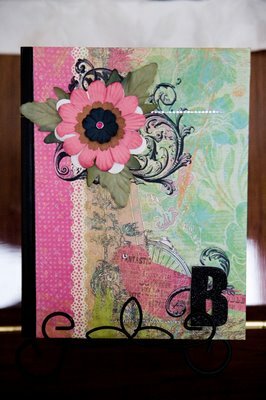 Published on January 27, 2009 August 9, 2016 by Bobbi-Jo G.
Thank you all for your wonderful suggestions for my notebook! Some of them I had already considered doing, while others were a revelation! It was nearly impossible to choose WHAT to do with it after hearing all of the great suggestions, so I decided to combine a bunch of them! I added some sticker tabs every few pages throughout to divide the notebook into different sections so I can use the one notebook to serve many purposes, which works out perfectly for my sometimes hectic life! Now I have ONE notebook that serves many purposes. I labeled the first (and largest) section as my journal. This isn’t for every day happenings, but is a place where I can lay out my innermost thoughts and feelings and have a platform to spew my mental diarrhea (sorry for the mental image there). I find that writing down my sporadic thoughts is very therapeutic and I often find myself solving my own problems as I’m writing. My entries may be just as sporadic as my thoughts and not really connect together at all, but it’s a spot where I can make sense of my claptrap through writing. Especially during those few very hormonal days of the month where I feel the world is crashing down on me, and it’s really just a silly acorn. You know what I’m talking about. The fourth section is labeled “Books” – a small section meant to serve as a place for me to jot down titles of books I’m interested in reading. I come across many great reviews on blogs, or from friends and for the life of me I can’t remember the title or author. Now I have a place to jot those down. The next section is for my to track my health and my weight. I write what exercise I’ve done, what my current weight is, what I notice my food weaknesses are, and any ideas I come across to help me in the fitness part of my life. Good times. The last section is a spot to jot down any fun scrapbooking/crafting ideas or inspiration I come across. Simple. SO, thank you for your help! I loved your suggestions, and as a thank you – I’m going to make another notebook for one of my readers. Just leave a comment at the end of this post, mention if you’d like to be entered in for a notebook, and I’ll draw a name on Friday! I really am grateful for your help and your inspiration! On that note- I was certainly inspired by THIS link found on Just About Perfect. It was an idea for a family notebook/binder and I knew I had to do it right away. I covered a regular 3-ring binder and filled it with sections titled things like “To do”, “Menu/Shopping”, “Budget”, “Home Storage”, “Family”,”School”, “Household cleaning”, and “Phone Directory”. It’s a one-stop shop for everything our family tries to keep organized. I LOVE it. I’m tired of findind papers lying all over the house, really not belonging anywhere. This is an easy way to keep everything organized and in one spot. I’m working on an Emergency Contact list to paste on the inside cover, so babysitters – or even myself – can have a quick reference with things like our cell phone #s, the Doctor’s #, Dentists #, and health care #s etc. I think it will be a great resource. I hope you’ll check out the link because there are a ton of other fun organizing tips/tools on the site. Okay, being stuck inside the house for days on end does have it’s good points I’ll admit. I finally got around to scrapbooking some pics I took of my girls back in November. 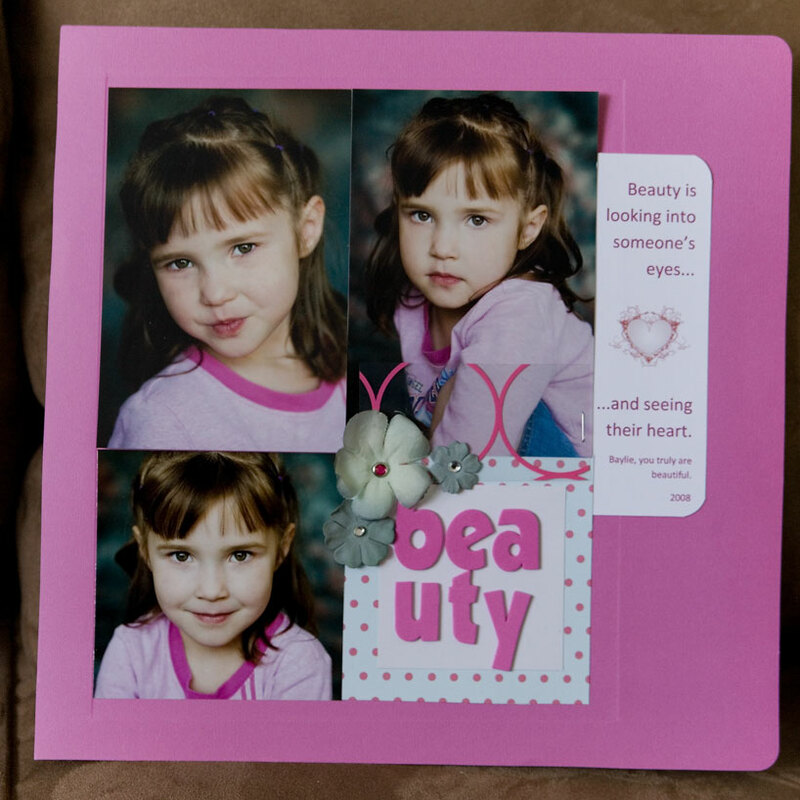 These aren’t very involved pages – they took me next to no time to do, but I like how they turned out (and it has absolutely NOTHING to do with the super adorable, smoochable girls in the photos). Oh! 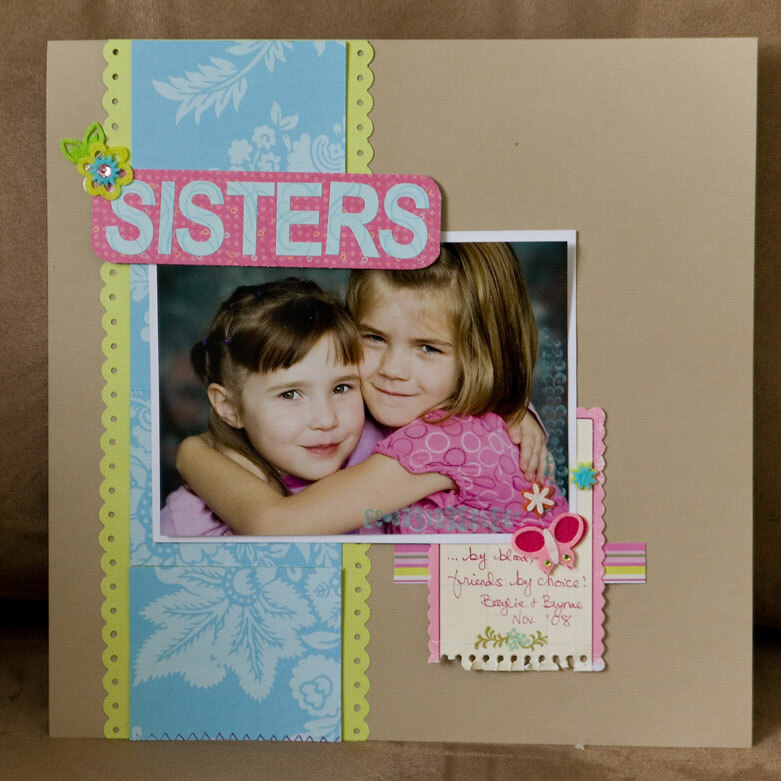 And before I go – I am tickled pink to have been awarded the “Encouraged” award from Laura over at Picture This… Scrap Happens. YAY!! It brightened my day!! It’s nice to feel that the time I spend on this blog isn’t wasted – and your comments and support just lift my spirits SO much. Thank you! So, now I’m going to pass the award along to a blog that keeps me feeling encouraged! I loved reading her blog not only for the crazy amount of crafty brilliance exhibited, but for her astounding positive attitude toward life. She is forever encouraging not just me, but hundreds of readers with her cheerful, though always real posts. She has a wonderfully positive view on life, and even during tough times ( ’cause we all have them!) she is able to exhibit a wonderful eternal perspective that helps those troubles seem lighter. It’s wonderful and I never leave her blog feeling unhappy or discouraged. So, what better winner of the “Encouraged” award than Heather D. White! You deserve this 100% and more! So, if you are still with me – feel free to leave a comment if you’d like to be entered to win a covered notebook! I’d love to repay you for your inspiration! oh, I am SO in!!! I would LOVE a special notebook made by you! : DThanks for that link for the great idea of keeping everything in one place……I still am addicted to those sticky notes though….maybe I could just stick my sticky notes in the journal. LOL! Wow! Great post Bobbi! Love what you did with your notebook & I'd love to be entered to win one of your wonderful, beautiful creations.I just love your last layout “Psst” gorgeous! REALLY wish I could make my blog more interesting like yours… always love and look forward to your posts.. 🙂Enter me… would love something made by you !!! Uh, yah. The second I saw that I thought I needed one. What a great idea to have something so adorable to keep it all together in. I could use something like that for sure! I hope I win, I hope I win, I hope I win. If not, I may have to pay you to make me one anyways.Love that you divided up your book for the numerous things you’ve got going on in your life. It is going to be perfect to keep tabs on all those things. Bobbi-Jo…..I absolutely love you. Thank you so much for your kind words. You absolutely made my day today. I will forever be grateful that we were brought together through blogging and hope to be able to meet you in person someday. You are so great! I loved that notebook the first moment I saw it but obviously we all know that I don’t/can’t win anything so I hope whoever wins LOVES your creativity!! !Oh and I love love love that PSSST I love you page. too adorable. I’m in. Love these notebooks! And I love how you turned it into a multi-tasking tool. Fabulous! All great ideas for the notebook! I love the quote by Joseph b. Wirthlin, too. Beautiful layouts, as always. wow, I came to leave you a suggestion and you already have oodles of them. Awesome!I know you already have a great idea, but I still wanted to share my thought…I saw in the Ensign where a stake president encouraged them to start a “let it rain” journal. He said, “personal revelation is like rain. It comes drop by drop, and if we would create a reservoir for it, so to speak, in our journal, we’d be surprised at how much the Holy Ghost promts us everyday. He prompts us to write in our journal any questions we might have and pray about them. When I tried this, I was astounded at how much personal revelation I had been overlooking”.When I read this, I decided that I want to try it too. I think it would be amazing to reflect on and I loved the idea!Ok, now that I have left a little inspiration, I would love to be entered to win a notebook! I abslutely love it!Thank you so much!! Love that you have so many different areas in the note book. I have all those, but in different ones. So smart to have it all in one.And love the comment above about the revelation. 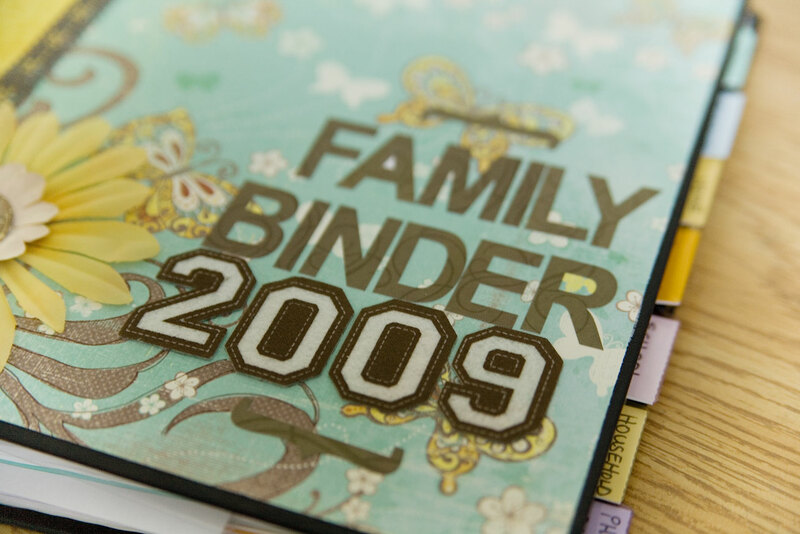 Have to try that too.And I’m amazed you made a family binder so fast. I’ve been wanting to do it forever and never get to it.You’ve inspired me to just get it done. NOW. ok.. maybe tomorrow. What a fabulous idea to keep things all together. It’s a good life!Terri E.
Oooohhhhh I too would be down with a notebook ‘by Bobbi-Jo’!! May I please be added in your Notebook draw too!!!! I would LOVE a beautiful little delight, made by your own stylin’ hands… Staples is no where NEAR your creativity 🙂 xox P.S LOVE THAT FAMILY BINDER IDEA!!! I would love to be entered please. I was also wondering where you can find those compostion booklets to cover. I went to walmart and they only had the coil ones. Thanks! Bobbi I love the notebook idea!! I’d love one made by you even more since my stuff is all packed up still! !And I’m in love with the Family binder idea I sooo think I need to make one! I thought of it today when I left for my dentist appointment and my mom was at home with E… she has no numbers or anything and I didn’t even have my cell with me. Im in! Your creativity astounds me!